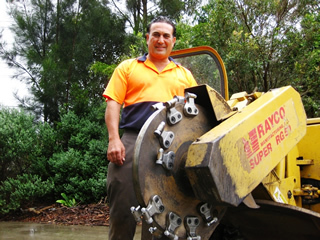 Greenteeth® are America's favourite Stump Cutter Teeth and now they are in stock and readily available in Australia and New Zealand! The Greenteeth® design is unique in that the tooth can be quickly rotated three times to give your machine three sharp cutting edges before the tooth needs to be sharpened. Kevin Green designed the original tooth concept way back in 1997, and now the new LoPro® pocket design takes performance to a whole new level. The unique design of the new Greenteeth WEARSHARP tooth allows the tooth to retain a sharp cutting surface as it grinds, unlike traditonal teeth that round over and go blunt. WEARSHARP is the tooth that NEVER needs sharpening, saving you time and money every day. Check our our MACHINES SETUP page for the tooth set-up configuration for your machine. All Greenteeth® are made in the USA using the finest materials, so why not grab a set for your machine and take it's performance to a whole new level. Thank-you for joining the Green Team!